First place a photo in Layer 1 by File > Place or Copy & Paste from clip board. Double click on Layer 1 to change the Layer Options. Set Dim Images to: 30% and lock layer. Make a new layer (Layer 2). 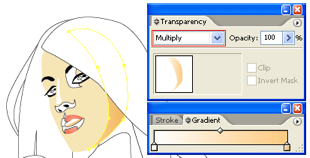 Hold down Ctrl key and click on the eye icon of Layer 2 to view Layer 2 in Outline mode. 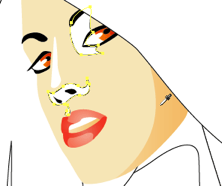 Use the Pen Tool and start tracing the basic features of the girl. While you are tracing, there are couple shortcut keys you should know in order to work more faster. Draw a new path as shown (top). 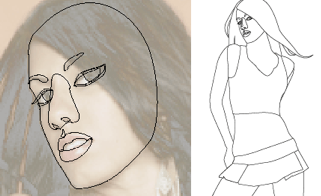 Then Copy the base path of the face and Paste in Front. Select the copied base path and the new path, open your Pathfinder, Alt-click on Intersect shape areas. Use the same technique from previous step and make all shadow paths for the overall illustration. You don’t have to get into the details yet, one simple shadow path of each part is good enough (ie. eye, lips, shirt, body, etc). Remember to use Ctrl+C for copy; and Ctrl+F to paste object in front. Trust me, this will save you a lot of time! 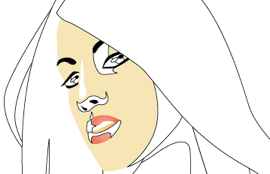 Now fill in the base colour for the face, eye, lips, and eyebrow. Fill the shadow path of the face with a Gradient (white-skin tone) and select Multiply for Blending Mode. Select the other shadow paths and use the Eyedropper Tool to copy the gradient fill of the main shadow path. For the lip and eye shadow, use the Eyedropper to copy the base fill and select Multiply Blending Mode. Use the same technique, copy the gradient fill for the body. Note you might to adjust the gradient of each shadow path to blend in with the overall illustration. Pretty much the same, fill 1 path with the gradient, then use the Eyedropper Tool to copy the fill. Same technique as the previous steps. Fill the skirt with a blue gradient, then use the Eyedropper Tool to copy the fill for the shadow. Now you can add more details to the hair. Make shadow effect by adding Multiply paths. Add some highlights by using lighter gradient color. If you want, you can add more details to the clothes, lips, or add a cool tattoo on her body. 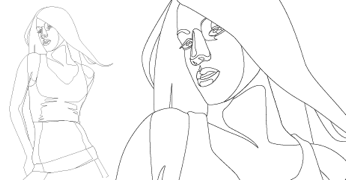 After you get used to this tracing technique, you can basically trace anything!